Issue 65 – released this week!!! Issue 65 features a chat with Manchester speed punks Revenge Of The Psychotronic Man who called time last year, so we catch up with what they’re upto now and of course about their time in the band. There’s a chat with south coast punk The Mistakes too. 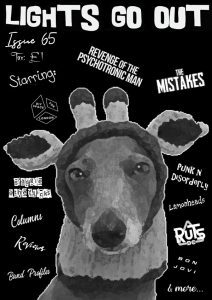 Also we chat with Basingstoke based DIY punk rock promoter, Punk N Disorderly. Also we have a column by John Huffman on DIY Space For London & some jokes from Emily. Anna Sanderson revisits the debut album by Bon Jovi. In this issue’s installment of Gadgie @ The Flicks, Marv tackles ‘Attack Of The Adult Babies’. Live Reviews: Ruts DC & The Lemonheads. Of course we have a stack of music reviews. And band profiles of Bloodrush, Lonesome, American Goner, Little Axis & The Suave Martyrs. Cheers for supporting Lights Go Out, much appreciated. Oh and the cover had a dog in a hat on it! What’s not to love about that?